Unique to JoBananas is our Custom Body Jewellery Configurator where you can design your own labrets, barbells, spirals, banana bars and circular barbells. JoBananas is the only website that has an online tool for you to create your own custom body jewellery designs which we then make to your exact specifications. Using our configurator you can choose what sort of jewelry you would like to make, either straight barbells, banana bars, circular barbells (horseshoes), labret studs or spiral twisters all of which can be made in either 1.2mm (16 gauge) or 1.6mm (14 gauge). You then select the material of your choice from 316L Surgical Steel, Grade 23 Titanium, Bioflex, Bioplast, Gold Plated Steel or Black PVD and the length or diameter that you require. 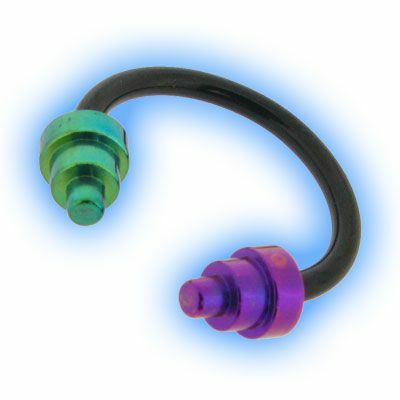 Finally you can choose what goes on the end(s) from a massive selection of threaded attachments including acrylic balls, plain steel or titanium balls, jewelled balls, words, stars, hearts, spiders, butterflies and snowflakes to name but a few! There are literally hundreds of thousands of choices available so you can create your own unique piece that you will not see anywhere else. Our customers love this feature and we love to see what they come up with when their imaginations run riot! We are going to showcase a few of our favourite designs on this page so you can see them too and maybe get some ideas or perhaps see your own jewellery featured here. 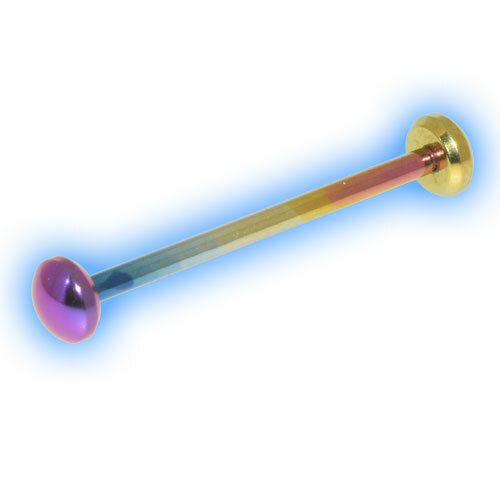 So this is a 1.6mm (14 gauge) Rainbow Titanium barbell with a purple and a yellow Titanium disc. This customer chose to make a 1.6mm curved Titanium Barbell in Purple with a Jewelled Snowflake one end and a multi jewelled top ball the other end - we think this would look awesome in a navel piercing, we have never seen another one! Titanium Step Cones in contrasting purple and green really stand out against the black of this 1.2mm (16 gauge) Circular barbell to create a stunning overall effect. We think this would look stunning in a pierced septum and again it is totally unique - you will not find another one of these anywhere else! 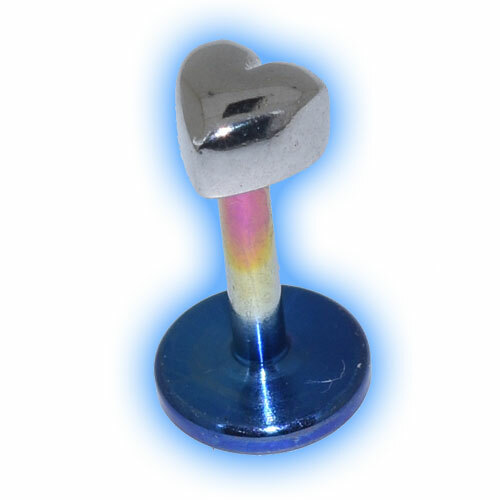 This is a 1.2mm Rainbow Titanium Labret which is 6mm long and has a cute little steel Heart added to it, we think it will look adorable in a lip piercing or even an ear piercing. The hearts look stunning in a pierced tragus. 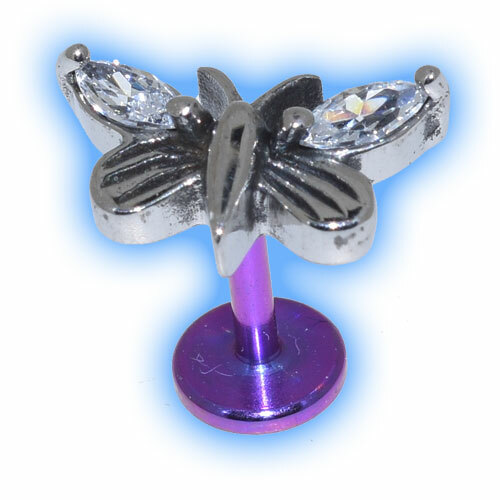 A Vibrant Purple Labret stud with a gorgeous Steel Jewelled Butterfly to set it off, we hope the recipient of this stud loves it as much as we do!